This reference is highly regarded for its accuracy, the clinical usefulness and readability of its entries, and its multidisciplinary approach to current terminology from all facets of health care. Individual experts in medicine, nursing, and allied health, researchers, lexicographers, and editors have researched, written, and reviewed each entry. Organized by major terms with related terms defined as subentries, Miller-Keane provides at-a-glance access to related information. All definitions are carefully written using clear, straightforward language to help readers understand new, unfamiliar or complex terminology. 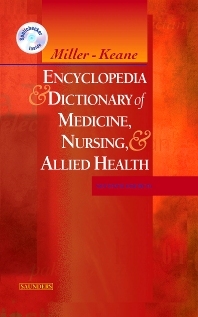 Encyclopedic entries are included for significant topics, such as diseases, disorders, or conditions. These encyclopedic entries include the definition along with a concise overview of the most important information related to Symptoms, Treatment, Patient Care, Prevention, etc. Dorland's spellchecker software and a companion Evolve website supplement this edition making it a powerful tool to building and using a medical vocabulary for all health professionals. A strong multidisciplinary emphasis facilitates effective communication between health professionals of all disciplines and specialties. Enhanced readability and accessibility with clear, complete, straightforward definitions helps readers master new, unusual or complex terminology and makes this dictionary particularly valuable for students whose first language is not English, or whose language skills are limited. Pronunciation guides enhance verbal communication skills. Subentry style of organization (similar to Taber's) allows related terms/information to be located in close proximity. Tables provide at-a-glance information on a variety of subjects such as insurance-related terms, abbreviations used in health care reform, and many other topics. A list of stems, prefixes, and suffixes teaches students how to analyze the meaning of unfamiliar words. "How to Use Miller/Keane" visual guide on the inside front cover illustrates this reference's many features. Insightful commentaries by prominent experts in nursing and allied health appear in 42 unique "Windows." The vocabulary of the Unified Nursing Language System (UNLS), including NANDA, NIC, NOC, and the Omaha system provides a quick reference for standardized nursing languages.